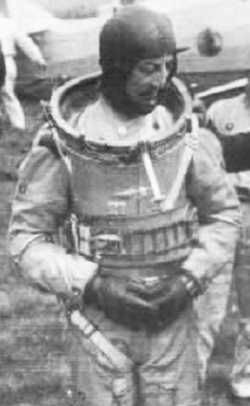 Italian pressure suit, used 1934-37. The first Italian pressure suit was used between 1934 and 1937 by Italian pilots Pezzi and Negroni to break altitude records with the Caproni 161, 161bis and 113 aircraft. The suit was made of several layers of canvas and rubber, with a metal collar to fit a cylindrical metal helmet with square view ports. Colonel Mario Pezzi and Marquessa Carina Negroni wore the suit in their attempts to reach altitudes over 6,000 m, including a record altitude flight to 15,500 m by Negroni in 1937. The suit was electrically heated and even had metal alloy restraint devices to prevent ballooning. Pezzi later achieved a record height of 17,004 meters in a specially-configured Caproni Ca 161bis (extended chord wings, huge four blade propeller, supercharged engine). However the suit was not used on this record since Pezzi was in a special pressurized hull within the biplane aircraft. Family: Space Suits. Country: Italy. Bibliography: 487.